Meanwhile, Skye is convinced that her house is haunted and is afraid her fiancé, police chief Wally Boyd, won’t move in until the ghost moves out. But ghost-hunting takes a back seat when Skye is called to the bowling alley, where a riled up contestant is choking a cat show judge for insulting his feline. Skye breaks up the scuffle, but the next morning the judge’s dead body is found, strangled with a cat toy. 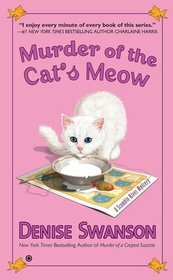 Now Skye must solve this purrplexing mystery—and show a devious killer that her sleuthing skills are the cat’s meow. I am getting through this series so so quickly! I am nearly up to date with the series and only started in May. I am pretty sure the next audio book I listen to will be the next in this series. I am addicted to the Scumble River Mysteries! This time around I didn't have a clue who the murderer was or why. It was pretty complicated in the end but it all made sense and it made for great reading. I love the way that Skye and Wally work together and I enjoy all the characters that pop up each time. The sub plots keep me coming back for more and it looks like the next installment with see Skye getting married! Looking forward to the next book. It will be interesting to see if Skye's ghost problem gets sorted and if she is about to become an aunt. Of course it will also be interesting to see what kind of murder investigation she gets caught up in next. This series is just your ordinary cozy mystery series but there is something about it that makes it addictive. With already eighteen installments I guess I am not the only one that loves Scumble River and its residents. I don't have any books from this author, but I might change that soon. You truly make me want to read this series.